Office assistant positions can be found in all industries, and share a rather large set of skills. Office assistants are sometimes known as secretaries or administrative assistants, but what they do is assist in the functioning of an office. Whether the office belongs to a law firm, a medical practice, an educational institution, or a corporation, the needs are similar; somebody has to file records, maintain schedules, and take care of routine communication on behalf of the people who use the office. That somebody could be you. 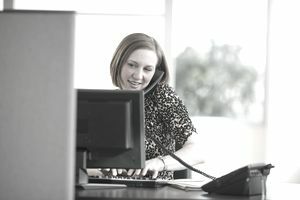 While office assistant positions are generally similar to each other, the job is still variable - it just varies from day to day, rather than from office to office. Today you might act as a receptionist, tomorrow might require repairing the printer, and the day after that, you’ll have to bring the whole filing cabinet into the twenty-first century. You’ll need a very broad skill set to succeed. Office assistants are among the great unsung heroes of the business world, because when you do your job right, nobody notices- the office appears to run itself. But some people enjoy the fast-paced yet flexible work, the feeling of being at the heart of everything. And a good secretary can still find work almost anywhere, in any kind of organization. You can use these skills lists throughout your job search process. First, the names of these skills function as keywords, so use as many as you can when writing your resume. Don’t rely on hiring supervisors to figure out that you have what they want, tell them directly. Second, you can use these same keywords in your cover letter. Focus specifically on the ones your prospective employer cares about most. You’ll have to do your research, because while office assistant jobs are often similar, hiring supervisors vary in their priorities. The job description will probably include a list of required skills. Pay attention to it. Finally, you can use this discussion to plan your interview. Make sure you have ready at least one example for a time you demonstrated skills from each category listed here. It may also help to review our lists of skills listed by job and types of skill. Verbal Communication Skills: Communication is a critical soft skill for an office assistant. You will have to interact with your supervisor, fellow office staff, the professionals you assist, and possibly clients or people in other offices of the same organization. You all work as a team, and you are its main communication hub. You’ll need to be cheerful, helpful, well-informed, articulate, and a good listener every day. Written Communication Skills: Most office assistants write a lot. They might write memos, fill out forms, or draft letters or emails. Some create content for the company website or edit text for others. Clear, professional written communication is a must. Friendliness: An office assistant might be the first person a client sees upon entering the office. If the office’s primary occupant happens to be out at the moment, the office assistant might be the only person the visitor interacts with. You must be ready to greet every visitor with a smile and a kind word and to help them with whatever they need so far as you are able. So, good interpersonal skills are a necessity. Technology Skills: In the old days, secretaries did a lot of typing. Times have changed and so has technology, but office assistants can still expect to spend plenty of time in front of a keyboard. Instead of a typewriter, you’ll have to know your way around a variety of software applications. Knowing how to do some light tech support and how to fix a recalcitrant printer doesn’t hurt, either. Organization: Office assistants must be extremely organized to effectively to juggle their many tasks. You’ll need to help keep other people organized, too, from maintaining calendars to keeping the office orderly. Problem Solving Skills: Problem solving, or critical thinking skills, are important for any office assistant, as you’ll often be the person others come to with questions or issues.